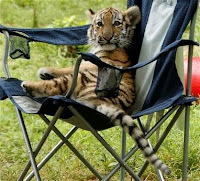 A three-month-old Amur tiger cub lounges in a chair at the Pittsburgh Zoo on Tuesday, Aug. 5, 2008. Born on Mother's Day, May 11, 2008, Amur tigers, more commonly know as Siberian tigers, are a critically endangered species due to habitat destruction and illegal fur trade. Peek-a-boo : A baby tiger named "Antares" looks out of his basket at the Tierpark (animal park) in Berlin.